Our bakery is making us famous in a way that makes us beam with pride. You see, we put a lot of time and effort into producing baked goods that are every bit as mouthwateringly delicious as those made by the best home cooks. The proof of our success is "in the pudding" as they say. Many individuals, couples and families come from miles around just to shop at our bakery, finding an assortment of goodies made with fresh ingredients and lots of TLC. When you have a hankering for authentic, homestyle pies, breads, muffins, cookies and other goodies, come to Eckert's bakery to indulge your passion for sweet and savory treats. What's your favorite flavor of pie? Apple, blueberry or cherry? Or, perhaps you fantasize about enjoying slices of fresh peach pie. At Eckert's bakery, you can indulge your desire for fresh baked pies by choosing any of the above classic flavors or select any of our other great flavors. Do you have fond memories of enjoying strawberry rhubarb pie while visiting grandma or an auntie? We offer this flavor for lovers of this country favorite. You can also find pies with a zesty lemon filling or smooth, silky chocolate filling. For those on a sugar-restricted or weight loss diet, we offer no sugar added versions for some fruit pie flavors, and they're just as good as pies made with sugar. There's nothing like enjoying meals or sandwiches with freshly baked bread, and at Eckert's, you can find several types of baked bread for those who love the taste, and for those who prefer bread that is made the old-fashioned way, with authentic, simple ingredients. In addition to our rustic style farm bread and white mountain bread, we also offer breads such as ciabatta, Irish soda bread and the classic French Baguette. While here, grab a few blueberry muffins, banana nut muffins and chocolate chip muffins for breakfast. They're great with coffee or tea. You can always count on Eckert's bakery for your regular supply of homestyle cookies in popular flavors such as chocolate chip and oatmeal raisin. 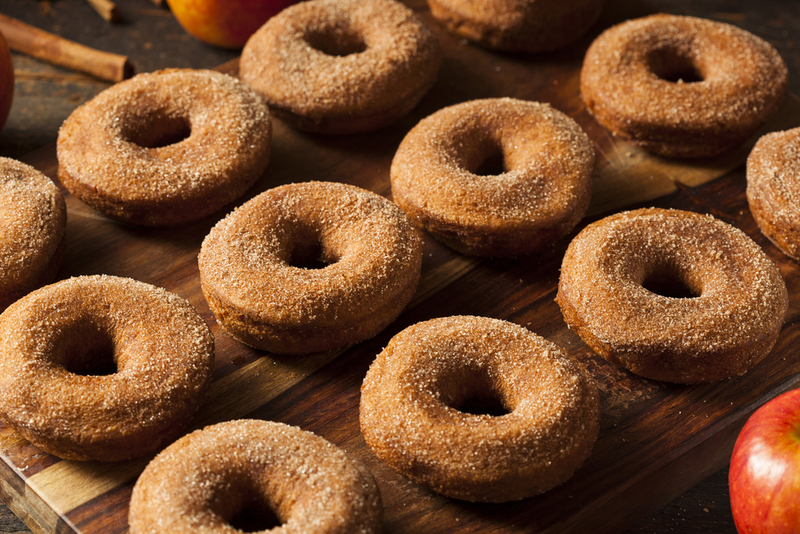 If you're in the mood for special treats, pick up a dozen or so of our cider donuts, lemon bars or decadent fudge. Enjoy the great taste of a home-baked pie without the hassle! Choose from our many varieties. Apple Pie – Crisp apples and just a hint of cinnamon combine to create an all-American classic. Peach Pie – A golden filling of luscious, tree-ripened peaches, poured into a tender crust. Cherry Pie – A tender, flaky crust filled with tart orchard cherries. Blackberry Pie – Dark, ripe berries harvested at the peak of their flavor heaped into a flaky crust. Dutch Apple Pie – Golden filling of luscious, sliced apples with loads of crumb topping. Caramel Apple Walnut Pie – Fresh from our bakery, plenty of apples, walnuts and caramel inside and out makes this a dessert you can’t miss. Strawberry Rhubarb Pie – Rich sweet strawberries & tart rhubarb blended together for a great taste. Rhubarb Pie – Fresh, young crimson rhubarb with the perfect amount of sugar for a sweet and tart taste you will love. No Sugar Added Peach Pie – Packed with ripe, juicy, flavorful peaches in a delicious, golden crust, without added sugar. 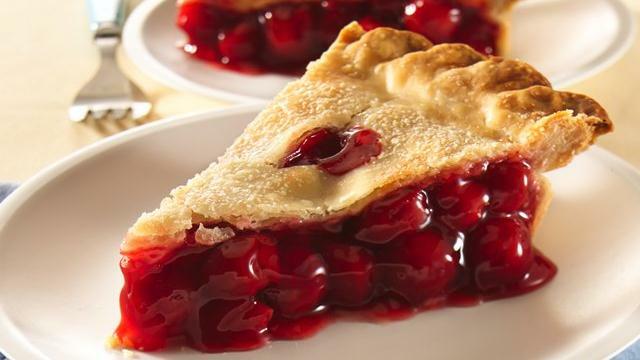 No Sugar Added Cherry Pie – An abundance of sweet, dark Balaton cherries piled high in a flaky crust with no sugar added. No Sugar Added Apple Pie – Overflowing with more than a pound of sweet, juicy apples, all baked into a tender crust with no sugar added. Apple Cranberry Pie – A sweet, tangy fruit pie that is grand in size and flavor. Our Apple Cranberry features crisp apples and refreshingly tart cranberries with vanilla. Coconut Cream Pie – Loaded with moist coconut shreds, from the sweet filling to the whipped cream top. Lemon – Full of zesty lemon and citrus filling that sits atop a sweet graham cracker crust. A tangy, creamy dessert that’s a traditional favorite. French Silk Pie – Featuring a rich, dark chocolate filling topped with whipped cream and garnished with a centerpiece of chocolate curls. We bake our breads fresh daily, so you are always guaranteed to have the freshest bread on your table. Mini Baguettes – Great for making bruschetta and served with pasta. Ciabatta – Great for a more refined sandwich, such as smoked salmon. Mini Sourdough Rounds – The sour tang gives this bread its distinctive flavor and is great for soup bowls. Hummingbird Bread – This sweet wheat bread has sunflower seeds, cracked wheat, barley flakes, wheat bran, rolled barley, and honey. White Mountain Bread – A light, tender, and airy white bread that makes a great sandwich or toast. Irish Soda Bread – A sweet bread that uses baking soda as its levening agent, giving this delicious bread a biscuit-like texture. Farm Bread – This plain and simple French bread is a classic, great for dipping with olive oil, basil, and parmesan cheese. Country White Bread – This simple white bread is perfect for sandwiches or breakfast. Wheat Bread – A full-bodied wheat flavor with a golden brown color. French Baguette – A classic, crispy crust that offers a mild, slightly sweet flavor. Seasonal – Seasonal items changing all the time… check back often. Banana Nut Muffin – This wonderfully tender and moist muffin is a classic and is perfect for breakfast, lunch or an afternoon snack. We also carry sugar free muffins. Chocolate Chip – They’re warm and gooey, sweet, chocolaty, and chewy – and they’re an American favorite. M&M – Now that’s my kind of cookie… fun, colorful, and tasty! Sugar – A sweet and tender cookie that has wonderfully crisp edges. We also carry sugar free cookies. Humble Pie – Our most popular treat! A delicious fruit pie for one! Homemade Fudge – Made from Grandma’s secret recipe; nothing beats this rich, buttery confection stirred to perfection.